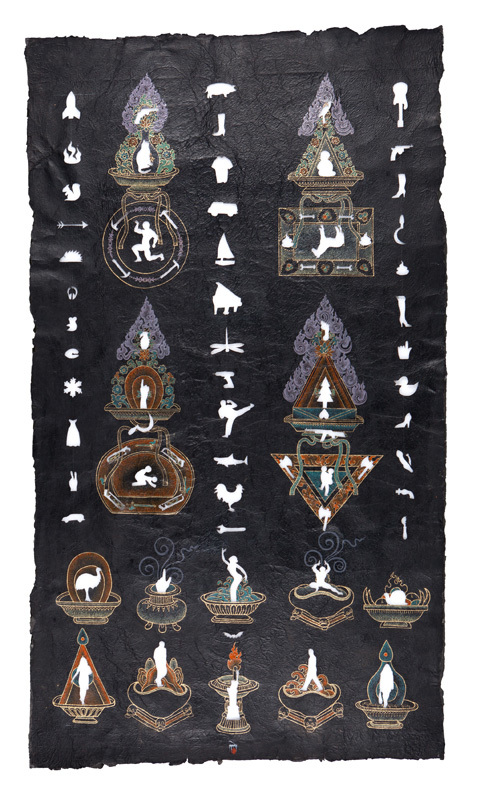 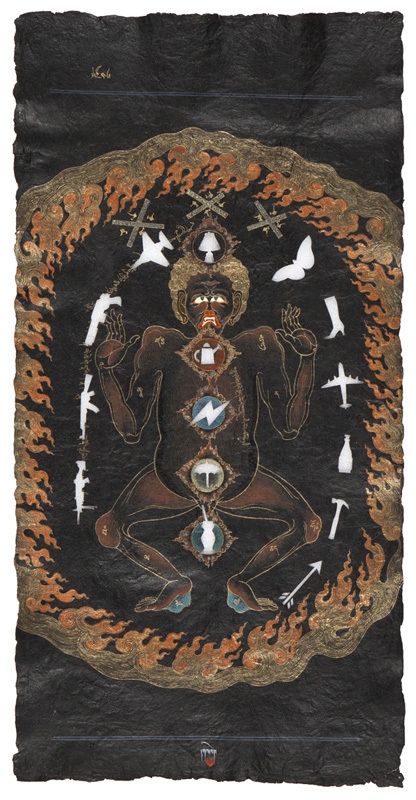 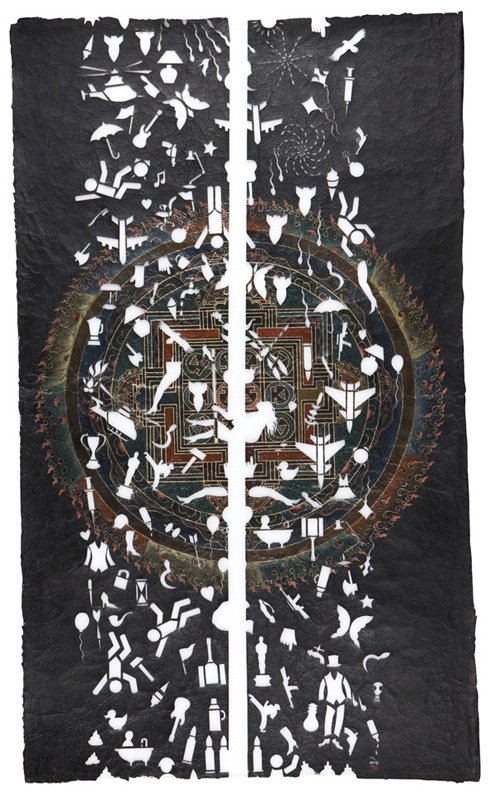 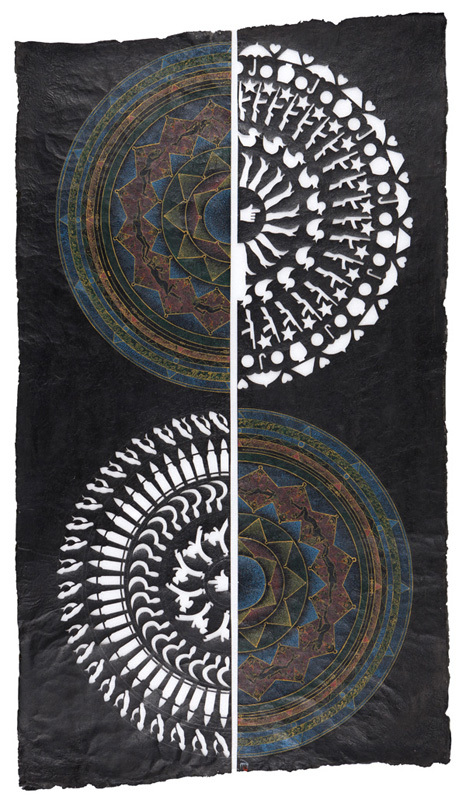 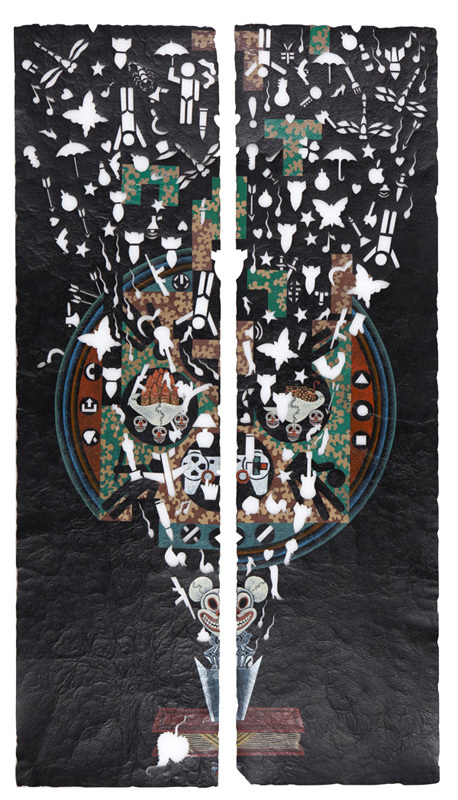 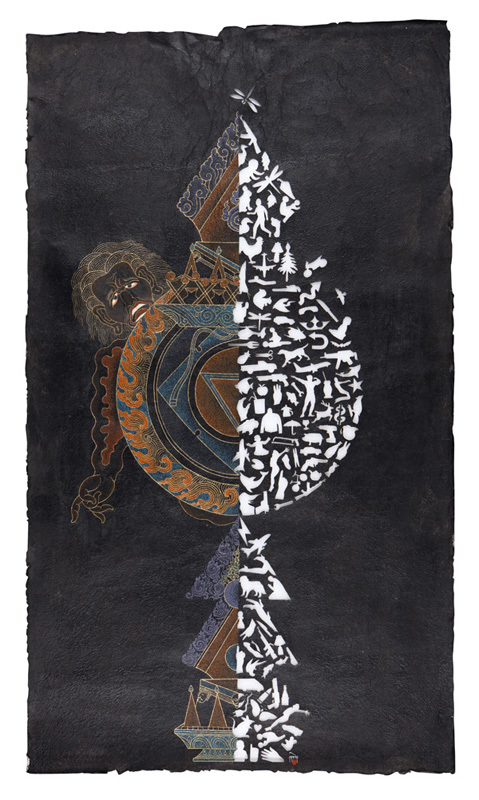 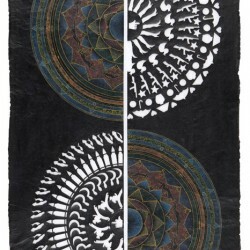 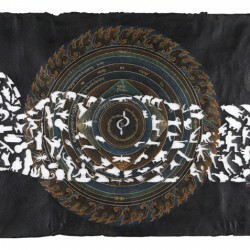 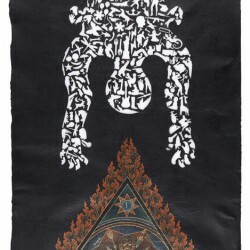 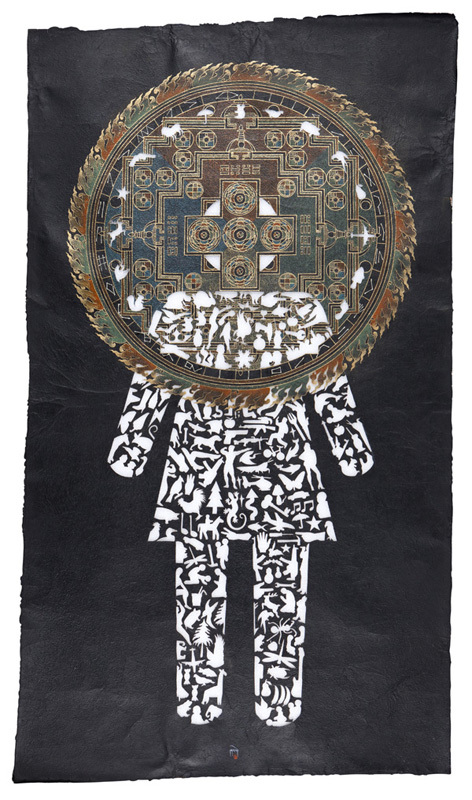 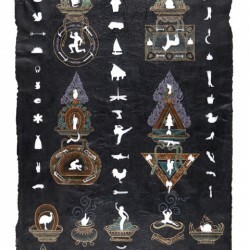 Boers-Li Gallery is pleased to announce the opening of “Black Classics” by Tibetan artist Gade, this Thursday, April 19, 2012. 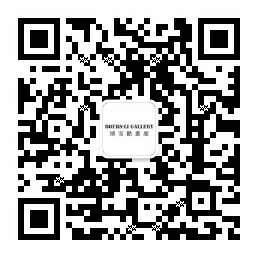 The exhibition will be held in Gallery II and will be on display through May 19, 2012. 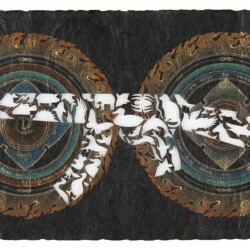 The artist first conceived the project “Black Classics” in 2011. 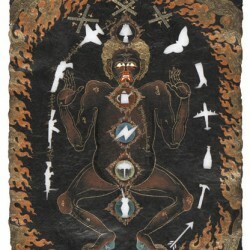 The “Black Classics” of Tibetan History were compiled by the fifth Dalai Lama Ngawang Lobsang Gyatso (1617-1682), as a record of his dreams. 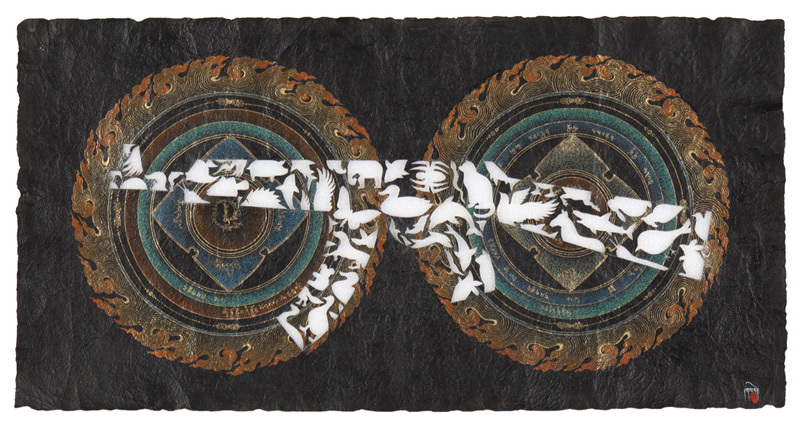 Unlike other Tibetan classics, it was drafted on black manuscript paper, hence its title. 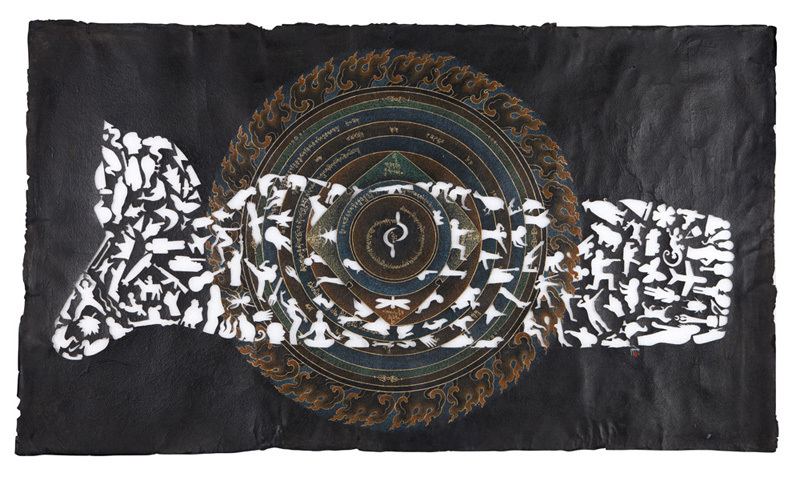 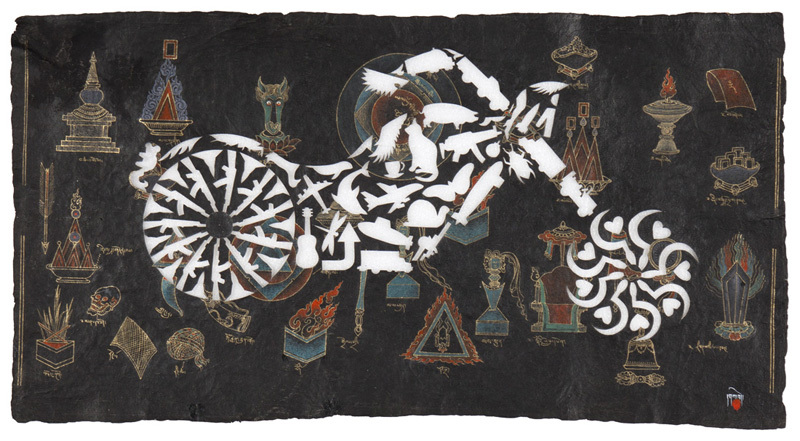 Under the same name, artist Gade uses this classic title as a context, recording his own dreams through paper cutting and painting; like a set of dreams 400 years apart, both on the same traditional Tibetan hand-made paper. 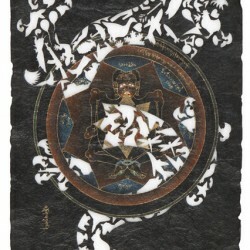 In Daoism there is a story of Zhuangzi dreaming of the butterfly, and in this story the romantic Zhuangzi is confused-- is it “he who is dreaming he has transformed into a butterfly” or is it “a butterfly dreaming he has transformed into Zhuangzi.” In Tibetan Buddhism, there is a religious practice of sleeping and dreaming as meditation for self-cultivation, with the aim of understanding the identical impermanence and illusion of both dreams and reality. 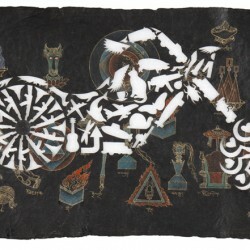 Regardless, dreams have become a way for us to bring together reality and the illusory. 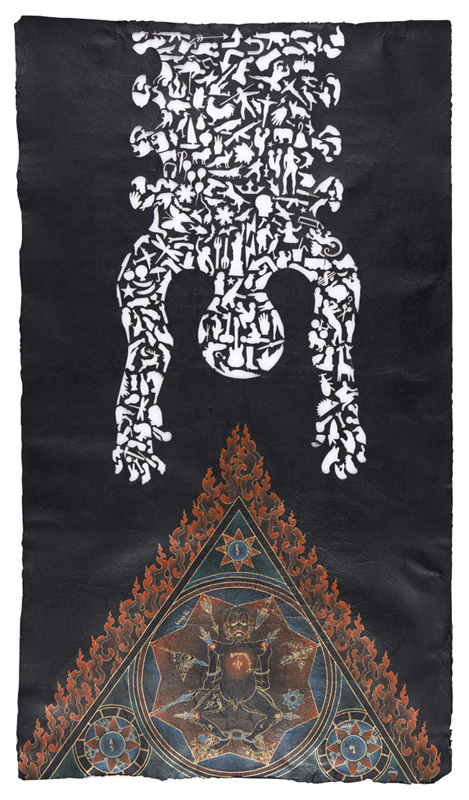 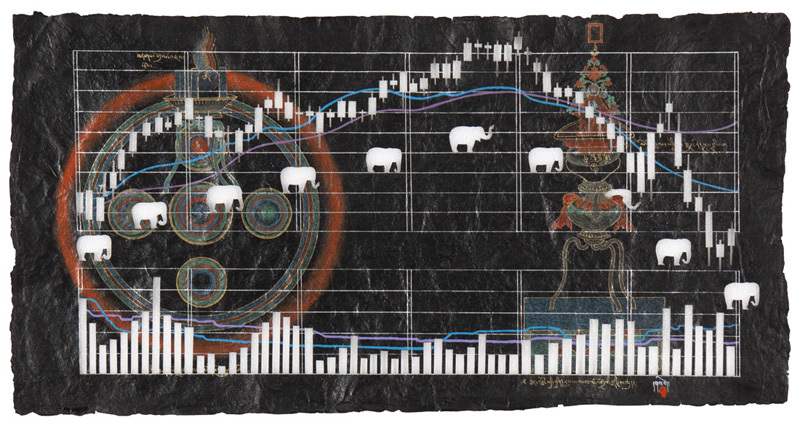 Contemporary Tibet’s reality and current events undoubtedly have great influence on Gade’s dreams, and in this project he uses a chaotic and conflicting set of symbols to shape his work. 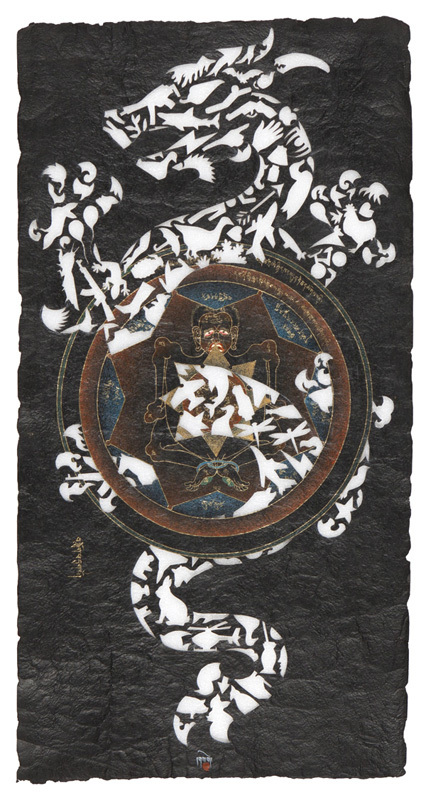 Yet the harmony of form and shape as negative space is a practice that emerged from the Fifth Dalai Lama’s own black pages of his book, emphasising the subtle contrast that constitutes the void between emptiness and reality. 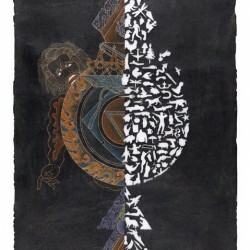 Whether this work is a compilation of chaotic contemporary symbolism or the subtle contrast of emptiness, it expresses an extraordinary conflict of the heart between a culture and society, and such a bitter conflict of the heart can perhaps surpass even our own imagination. 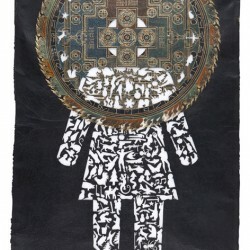 Gade (b. 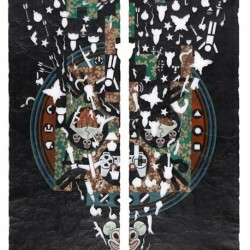 1971, Lhasa) graduated from University of Tibet in 1991 and currently lives and works in Tibet. 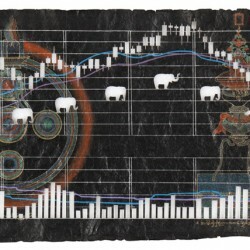 As one of the major representative artists of Tibet, his exhibitions include: “Waves on the Turquoise Lake: Contemporary Expressions of Tibetan Art” (University of Colorado Museum of Art, U.S., 2006), “Reincarnation” (Doris McCarthy Gallery, Canada, 2007) and “55 Days in Valencia” (Valencia Museum of Modern Art, Spain, 2008). 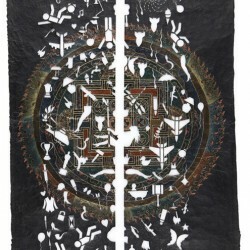 He has also been invited to participate in the upcoming opening of the Sydney Biennale.